Morning Mirror: Washington Reporter Says If You Like Trump You’re A P.O.S. — Carl Gottlieb, self-described recovering TV journalist. “Trump is a pos and if you support him so are you. f you voted for him you’re not a good person. I don’t care if you voted for Hillary or not. But if you voted for him you’re a bad human being.” — Oliver Willis, senior writer, ShareBlue, formerly Media Matters. “What’s the point of having this exam at all if the results aren’t honestly transmitted to the public? Why have we never had real medical results or tax returns from @realDonaldTrump? Why is one person in history allowed to get away with this corruption?! No one, medical expert or not, who has looked at, watched, or listened to that obese, lazy, sniffling, hyperventilating pasty man would ever in their right mind think he could even remotely be in decent health. Why is this even a debate?” — Jamie Schler, food and culture writer, The Washington Post. In it, she writes about her white American friends calling her racist for calling out the Uber Eats guy when a black man walked in the door. That black man turned out to be the Uber Eats guy. So…the joke is on them? Here. She also masquerades as as sugar daddy/baby expert. “One of life’s great pleasures (at least for me) is eating a meal alone with a great book, magazine, or even with my laptop or iPad.” — Yashar Ali, HuffPost, New York Mag. “Of course Trump is making a Trail of Tears joke. To even leave open the possibility that it’s some other trail is stupid and dangerous. I mean, which part of “Andrew Jackson is my favorite president” didn’t everybody understand?” — John Stanton, former BuzzFeed reporter. “Here’s some free advice: if you’ve gone out/ordered in every single meal for the last 6 months, and you start wondering how much money that is, so you pull up your bank account and start adding it up, just don’t do that.” — Nate Blogg, Barstool Sports. “Remarkable interview right now between @JillAbramson & @brianstelter. She just is flat out refusing to concede she plagiarized, suggesting it is okay to take people’s words if you put an endnote 300 pages later.” — Oliver Darcy, media reporter, CNN. Abramson “wrote” Merchants of Truth. Read all about what a VICE reporter thinks of what she has done. “Some personal news: I am very happy to announce that I just set new personal record for longest CVS receipt for a single-item purchase at 58.5 inches.” — Ryan Struyk, CNN. “Eventually the food is served & Gillibrand starts to eat her fried chicken with a fork. She looks around, sees other people eating with their hands and says ‘Um Kiki, do we use our fingers or forks for the chicken?’ Kiki said to use her fingers, and use her fingers she did.” — Jasmine Wright, CNN political campaign embed. 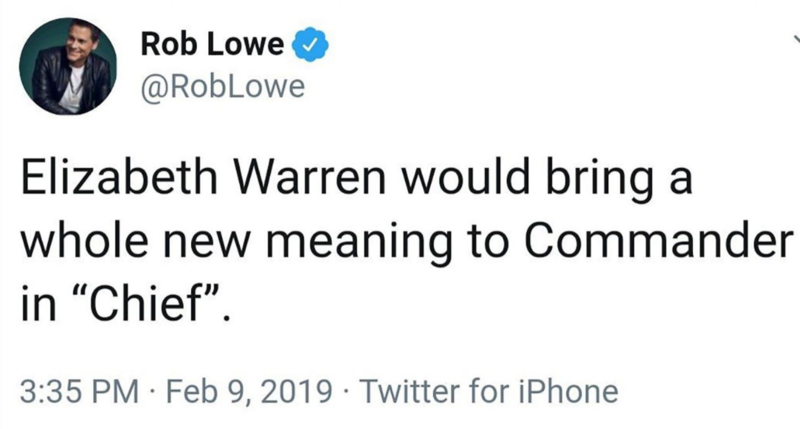 The peanut gallery: “Rob Lowe deleted his moronic, ignorant tweet about Elizabeth Warren. He is triggered and I am here for it.” — Elizabeth Thorp, editor-in-chief, PYPO Studio, appeared in House of Cards. “I really don’t understand the fascination with having to get the newest, latest phone. My iPhone 7 Plus works just fine. In fact, I had the batter changed in my 6 Plus and that works great too. I use it for my drone and a 2nd live streaming camera. Don’t go broke chasing BS!” — Roland Martin, host, Roland Martin Unfiltered. “I wear my necklace everyday because God/faith is an important part of my life. I’ve worn a cross since I was a child. Any other questions?” — Madison Gesiotto, TV commentator, columnist, The Hill. “Heading to Colorado for vacation for 5 days. Please send tips on how to take vacation.” — Chuck Ross, reporter, The Daily Caller News Foundation. “Ketchup is amazing on mac n cheese.” — Caleb Hull, director of content, TargetedVictory. Rep. Walter Jones (R-N.C.) dies. Here. Stormy Daniels performs at the Mile High Men’s Club (of course) in Denver. “Thanks to everyone who came out to see me at Mile High Men’s Club in Denver! The support was overwhelming! Next stop is Omaha!” — S.D. A Texas pol calls Rep. Alexandria Ocasio-Cortez (D-N.Y.) a “bimbo.” Here. D.C. millennials look to side hustles to make extra cash. Here. How FNC’s Tucker Carlson helped save this guy’s life and throw his weed out the window. Here.